Description: I ran this through Topaz Adjust to get this effect. This is the best image of the lot. Although the Topaz software is the real artist. Love the grittiness, movement and colors. Wow, I thought this was one of Maureen's paintings! Maureen I thought of you the second I saw this. I love this! I would like to see the original. Very, very cool! I love what you did with this photo. It does look like a watercolor and if it were for sale I would buy it! My favorite! It would be impossible to top this. I love this photo and agree with everything Salvo said! Very nice job! Wow! Maybe I should toss my paints! I really like your persective of the shot. 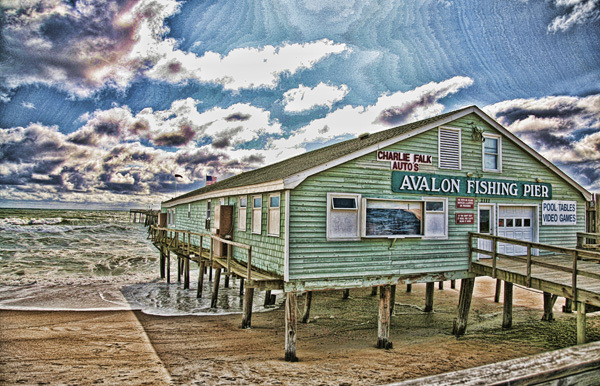 I think Avalon is a tough pier to photograph and you've done a great job here. You can do all the digital enhancements to improve or change a photo, but I think that if you start with a great photo, like this, it's just the first step in creating a great entry like yours! I love it! Looks like a watercolor.